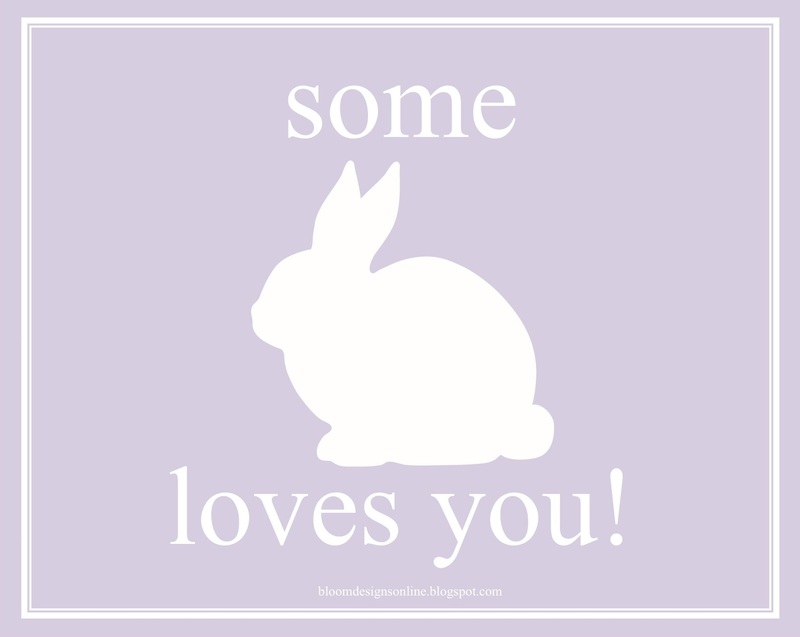 bloom designs: Happy Friday- Some Bunny Loves you! Happy Friday- Some Bunny Loves you! So excited to announce last week's winners of our 100,000 page view give away. The response was amazing. We are already at 210,000 page view, believe it or not. We will do another huge giveaway party at a million:). So if you didn't winner this time, keep reading! $50 Credit to my Etsy Store- Lindsay from Easy Made Invitations (amazing store and blog by the way, check it out). A set of gumball tubes- Donna from Epicurian Crafter. If you would like this very last Easter decoration for your celebrations, leave a comment with your email and I will send you this 8x10 print without my blog name on it. I will be happy to send it to you but ONLY IF YOU ARE A FOLLOWER OF BLOOM (MY BLOG). It is available in pink, purple, green or light blue. Have a super weekend filled with blessings! Don't forget to spread some bunny bait on the grass to attract the Easter Bunny and please take lots of pictures to send in! Adorable sign and blog! Just found you through pinterest, and subscribed! I am having fun looking through past posts, and will look forward to reading your new ones. Please email me a copy of the sign in blue to chandrareilly@aol.com. Thanks for another great freebie... I am a follower.. LOVE all the colors.. greatflowerlady@gmail.com would love to have you follow me too.. greatflowerlady.blogspot.com I also do freebies..
Would love this! Any colors will be fine! I would love the green please. I do follow your blog, and it's lovely. (Would it be possible to send the green and pink?) Thank you! I am a follower and would love all colors. I am a follower. I would love to have all colors. Thank you! How cute - I just printed some of your tags - pls send these to me. I am follower ! I printed off your tags and they were a big hit ! Please send me the sign in all three colors. Hey there from VA!! Love reading your blog!!! Thanks for sharing!! May I please get the bunnies in all colors? I am a follower! Thank you and Happy Easter! Too cute and just perfect for my darling grandchildren! Could I please have it in all the colors? What a gorgeous design! Found you through Pinterest and subscribed. Would love all the colours please! Email to ndownes@tpg.com.au Thanks so much! this is adorable!!!! would love to still get this in all of the available colors. thank you so much for sharing and for being such a great inspiration. Just found you via pintrest - following!!! How could you not. Amazing you are. would love this printable! tiffanycgsr@gmail.com.